Recently I went on a trip to see some family members who I love dearly although I rarely get to see them. Regrettably, they do not have a relationship with the Lord. There are several things the Lord reinforced to me during this visit that I think may be valuable for all of us who have unsaved loved ones and want to know how to interact with them. Secondly, we must remember that we are all in a spiritual battle. Satan—sometimes referred to as the devil-- is the Enemy of our Souls and the ‘Father of Lies’ who deceives us into thinking that living to please ourselves by investing our time, energy and resources on our other ‘god/s’ will satisfy the desires of our soul, which they cannot (Ephesians 6:11-12; John 8:44). Satan’s goal is always to ‘steal, kill, and destroy’ what God loves, and what He loves most is mankind with whom He longs to have an intimate and loving relationship. Satan seeks to destroy us by keeping us from having that relationship with God, through Jesus, Who is ‘the Way, the Truth, and the Life’ (John 14:6). We who know Jesus have been called to be His warriors...warriors who ‘fight’ for the souls of those who have been taken captive by Satan. If we are not careful we can forget that our battle is not against ‘flesh and blood’—and sometimes we want to act out ‘in our flesh’ against our unsaved loved ones --but we must keep in mind that our fight isn’t with them, but against Satan and the forces of darkness. Just like prisoners of war, our unsaved loved ones have been taken captive by Satan to do his will (2nd Timothy 2:26). We can’t expect them to act in accordance with the truth of God’s Word, because they never knew it, or they have been indoctrinated in lies from Satan and blinded from walking in the truth. Only the Truth—the written Word and Jesus, the Living Word--can set them free from the clutches of Satan and empower them to live the ‘abundant life’—a life of peace, joy, and contentment, and open up to them the gift of eternal life. Our words are important to testify to that truth, but far more important is the life that we live before them. So what is our role as it relates to family members and other loved ones who have been ‘taken captive’ by Satan to do his will, and therefore are not living in accordance with the will of God? 1. Do not buy into their lies or fuel their sinful behavior. Filter what they say and do through the lens of scripture so that you do not contribute to their deception. For example, do not accept their rationalizing or blaming others for the consequences of sinful choices that they make. If you catch them in a lie, do not be afraid to lovingly confront them so that they do not think they can ‘sin and get away with it’ and so they will learn that their sin ‘will find them out’ (Numbers 32:23). 2.Do not indulge their deception that their ‘god’or ‘gods’ will satisfy them by ‘building up’ their ‘god’, but in love expose it for what it is— a source of temporary pleasure, but nothing that will truly meet the deepest longings of their heart, which is unconditional love and eternal security that only God can provide to them. For example, if sports is their ‘god’, don’t focus all of your conversations on sports which could easily lead them to believe that is your ‘god’ too. If they are an alcoholic, don’t support their addiction by purchasing alcohol for them. Or, if they are a ‘shopaholic’ don’t continually talk about things with them or spend your time together going shopping. 3. Do not enable them or attempt to rescue them when their sin ‘blows up in their face’. It’s not your job to save them, only Jesus can; it’s your job to represent His heart of love for them and to point them to Him. Remember that Jesus asks us to ‘come to Him’, but due to our pride we most often will not come to Him until we are desperate and aware that we have nowhere else to go. The biggest obstacle for people coming to Jesus is admitting they have a need. That is why it is so important that you do not try to rescue them, but allow your unsaved loved one ‘to come to the end of themselves’ so that they will finally turn to Jesus. If you want to help them out of a situation that was caused by their sinful choice/s, always pray first and ask the Holy Spirit to examine your heart motive and to lead you in His way. There are times when God may lead you to enforce ‘the law’, and there may be times when He leads you to show mercy, which is why you need to listen carefully to His voice. As painful as it may be to watch your loved one suffer for the consequences of their sin, remember that it is far better for them to endure suffering for a season in this world if it will lead them to turn to Jesus who alone can save them from suffering for all eternity! It is also important that you realize that you can fully entrust them to God’s care; He will be there to pick them up when they look to and cry out to Him! 4. Do not cram scripture ‘down their throat’ as they will likely vomit it out! Sometimes in our zeal for our loved ones to come to the Lord we ‘lecture’ them with scriptures, or in other ways communicate our disapproval of them. What they hear in their minds is that if my family who knows God doesn’t approve of me, then God sure will never accept me either! They often perceive that God is all about rules and regulations that are either impossible to keep, or only there to keep people from having a ‘fun life’. They don’t realize that God wants a relationship with them, not ‘perfect behavior’ from them. We need to demonstrate with our words and actions that we love them unconditionally, so that they will come to believe that if we who know them as ‘sinners’ can love them, then Jesus is more than able to love them too! 1. Assume your role as ‘an ambassador of Christ’ who has been given the job of representing Jesus and encouraging people to be reconciled to God (2nd Corinthians 5:20). You can’t represent Jesus if you don’t really know Him. So it is important that you make time to read and study the Bible where He reveals His heart, His character, and His ways; to be in fellowship with other believers who will encourage you in your faith; and to maintain communication with God through prayer. Jesus often asked penetrating questions to get people to consider the truth; a great way to represent Him is to learn to ask meaningful questions of our unsaved family members that will cause them to grabble with the big concerns of life, like: what is truth; what is the purpose of life; and where do they think they will go when they die and why? If they espouse to be an atheist or to believe in a religion other than Christianity, lovingly ask them why they believe what they claim to believe so you can earn the right to share with them your beliefs. Another way Jesus interacted with those he wished to reach was by telling them parables, or stories. Share stories of God’s faithfulness in your own life as well as testimonials of His life-changing impact in the lives of others you know; your unsaved loved ones are looking for the Hope you have and they want to have a reason to believe that God is real and all that He says He is in His Word! 3. Share the ‘good news’ of Jesus’ love for them if you have not already. As already mentioned, that opportunity often comes when your loved one is suffering from the sinful choices they have made. Help them to see their need for Jesus by lovingly helping them to see what their choices have cost them. Humble yourself before your loved one and let him or her know that you realize you’re not perfect or sinless either, that no one is except God. Let them know that Jesus has made the way for ALL who are willing to admit their imperfections and to turn from their sin to find forgiveness and new life through His death and Resurrection. Assure them that there is no sin that is too great that God’s grace, love, and mercy can’t cover it! Make them aware that when Jesus died on the cross, His blood was shed for every sin they would ever commit. You may wish to share with them this comforting verse from Romans 5:8: But God clearly shows and proves His own love for us, by the fact that while we were still sinners, Christ died for us. Let them know that all God asks them to do is to ‘come to Him’, to believe in Him, and to receive Him as their Savior and Lord, and to repent—or change the direction of their life— through the power of the Holy Spirit (John 6:29; John 1:12) Share the truth with them that only living in obedience to Jesus will ever bring true joy and fulfillment to their lives. Let them know they have a choice. Ask them, “Do you want to continue striving by living in your own strength, or would you like to finally start living abundantly through the redeeming power of Jesus?” You may say, “But what if I share the truth of God’s love for them and their need for repentance, and they reject that truth?” Keep in mind, they are already rejecting that truth by the way they are living, so what do you have to lose? 4. Focus your thoughts upon God and His desire for your loved one to come to know Him. Consider how different your unsaved loved one’s life would be if he received Jesus as his Savior. I just heard the story of a man who was saved in the military; he came home to his family and shared the truth of the gospel with them. At first, the family rejected turning their lives over to God, but as they saw the difference that Jesus made in the man’s life, they all chose to accept Jesus as their Savior. The man telling me the story said that was 43 years ago, and he was so grateful that his brother who’d been in the military loved him enough to share the truth with him, even though at first he was ‘fighting mad’ at him for doing so. The lives of each member of that family was radically changed because his brother loved them all enough to humble himself and overcome his fear of rejection to tell them the truth that alone could save them. Have you ever considered the blessing you would experience by being used by God to introduce them to Jesus? 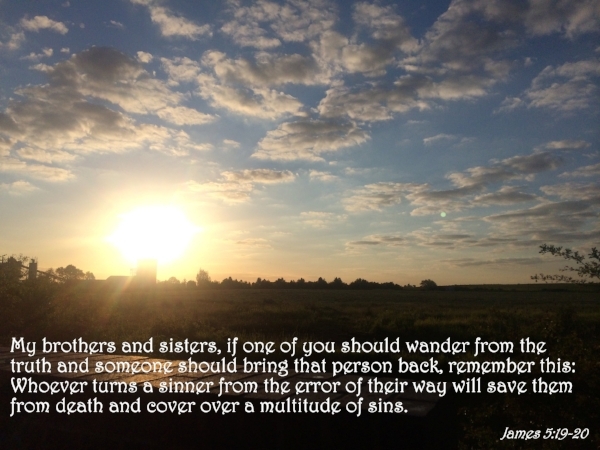 Be encouraged by these words from James 5:19-20: My brothers, if anyone among you wanders from the truth and someone brings him back, let him know that whoever brings back a sinner from his wandering will save his soul from death and will cover a multitude of sins. 6. There are circumstances under which you may need to set up firm boundaries, and even choose to entirely withdraw from a relationship with an unsaved loved one if they continue in their sin, especially if they are influencing you to abandon your faith in God. If you are sensing that you need to cut ties with a family member, make sure you are being led by the Spirit and not by your flesh. And welcome them back into your life with a forgiving heart and open arms if they ‘come to their senses’ and give their heart to the Lord. Lord, I release my loved one to You, knowing that You love them even more than I do or ever could. Fill me with Your heart of love for them, and empower me by the Holy Spirit to be a faithful ‘ambassador’ of Yours who accurately represents You and faithfully walks by the Spirit and not in my flesh. I confess that when I see my unsaved loved one’s lifestyle and poor choices that I often feel overwhelmed and helpless. Holy Spirit, guide me so that I know when to speak, when to remain silent, and when to take action. When you lead me to speak, give me your Words of truth and life to speak to them.When you call me to act, may I do so with all humility and in the spirit of Your love. I ask that you would arrest their hearts and minds and bring them into alignment with Your will! Send forth the Holy Spirit to convict them of their sin, of righteousness, and of the coming judgment! (John 16:8-9) May they come to know You, the Source of abundant and eternal life! Amen.